Love candy like I do? 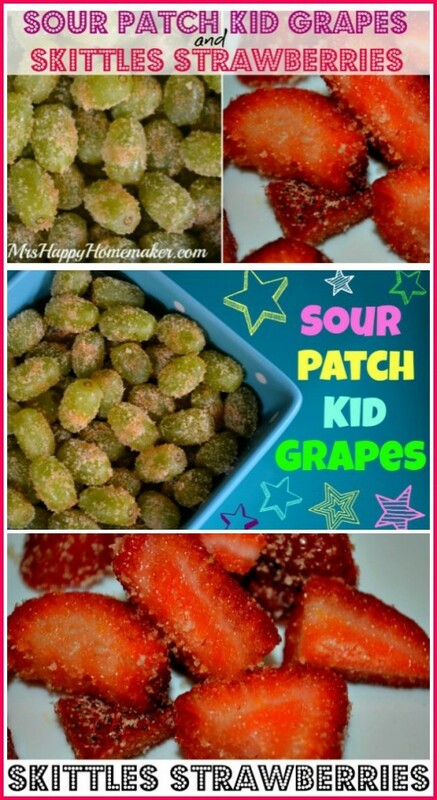 Now you can make Sour Patch Kid Grapes & Skittles Strawberries with just 2 ingredients & they taste just like the candy! To this day, I still love my sour patch kids. I’ve been known to put them away as fast as I can get them in my mouth. Probably not the healthiest thing…. but man, yum. 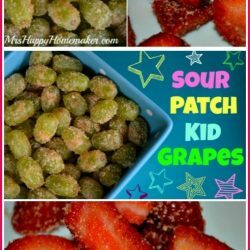 So, when I ran across a recipe on Pinterest about making grapes taste like sour patch kids, I was all in. I mean, I had to try them. 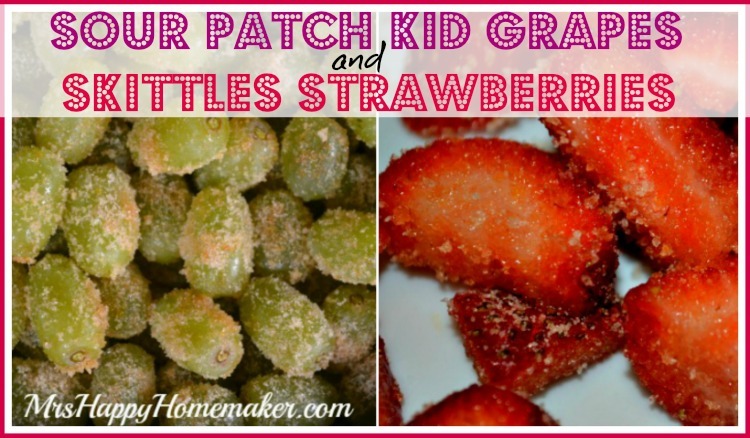 A healthier way to gobble up sour patch kids? Yes, please! 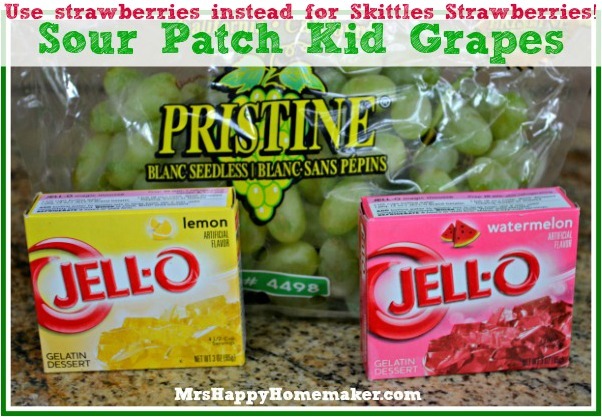 Here’s what you need – just note if you’re making the Skittles Strawberries – you need to use strawberries instead of the grapes! 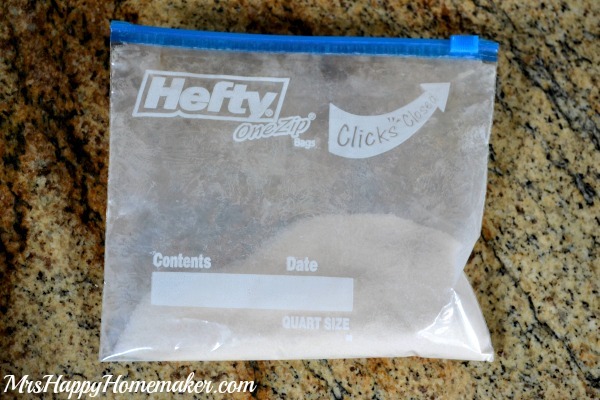 Mix together the lemon & watermelon jell-o powder together in a resealable plastic bag. Just the powder! 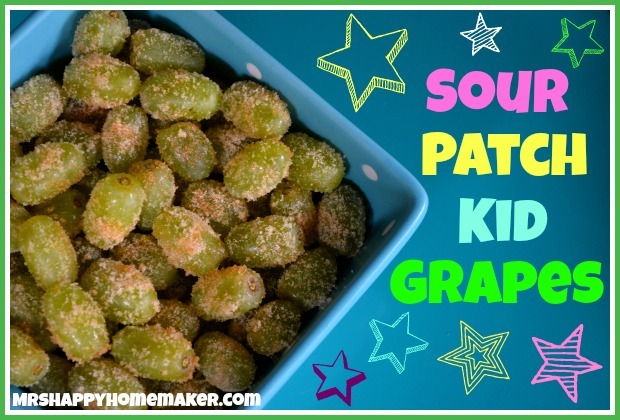 To make the Sour Patch Kid Grapes, simple give the grapes a quick rinse – and let them drain in a colander. They need to be damp, but not sopping wet. 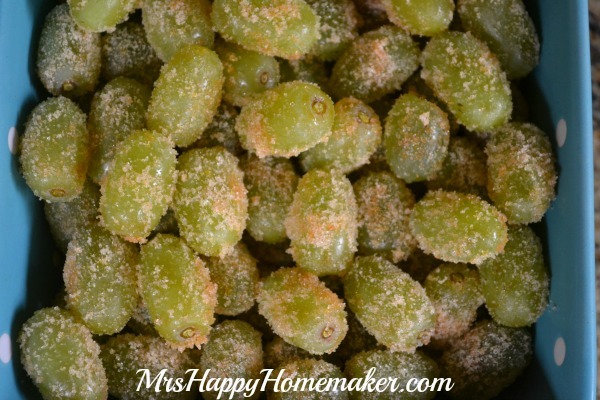 Pour some of the jell-o powder in a dish, and throw in a handful of grapes. Gently shake the shallow dish to cover the grapes with the powder. 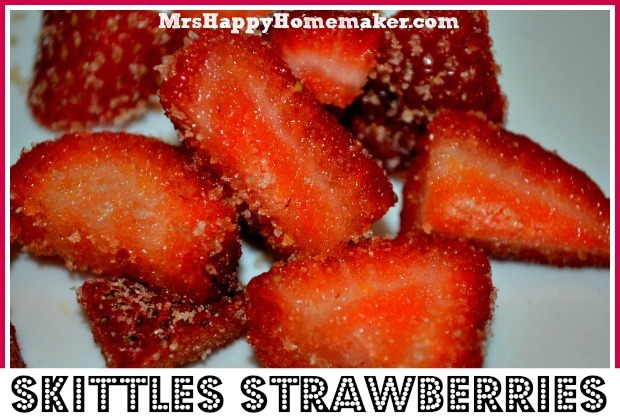 If you’re making Skittles Strawberries, no need for them to be damp! Just slice them into pieces, and shake the dish just like you would with the grapes. You can start eating them right away, but the grapes are even better when they sit in the fridge for at least an hour. The strawberries are best eaten as soon as possible, and definitely within 24 hours.And, oh my – are they both ever delicious! And, you don’t even have to feel guilty eating them! 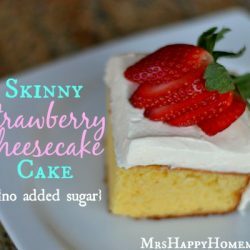 Printable recipe after video tutorial! Combine the 2 jello flavors together in a plastic bag, & shake to combine. Pour some of the powder into a shallow dish. If you’re making Sour Patch Kid Grapes, give the grapes a quick rinse & let them drain in a colander. You want them to be damp, not sopping wet. Place a handful of grapes at a time in the dish, and gently shake around until the grapes are coated. Store in the fridge. 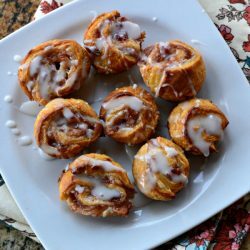 You can eat immediately, but they get even better after sitting in the fridge for at least an hour. If you’re making Skittles Strawberries, chop the strawberries into slices or bite sized pieces. Place a handful at a time in the shallow dish filled with jell-o powder, and gently shake around until covered. You can eat immediately. 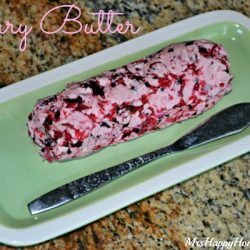 Store in the fridge..
What a fun and healthy treat! I can’t wait to try these! « Previous PostBut, First Coffee – Seattle’s Best Coffee Giveaway!